Accepted Scientific Name: Coryphantha elephantidens (Lem.) Lem. 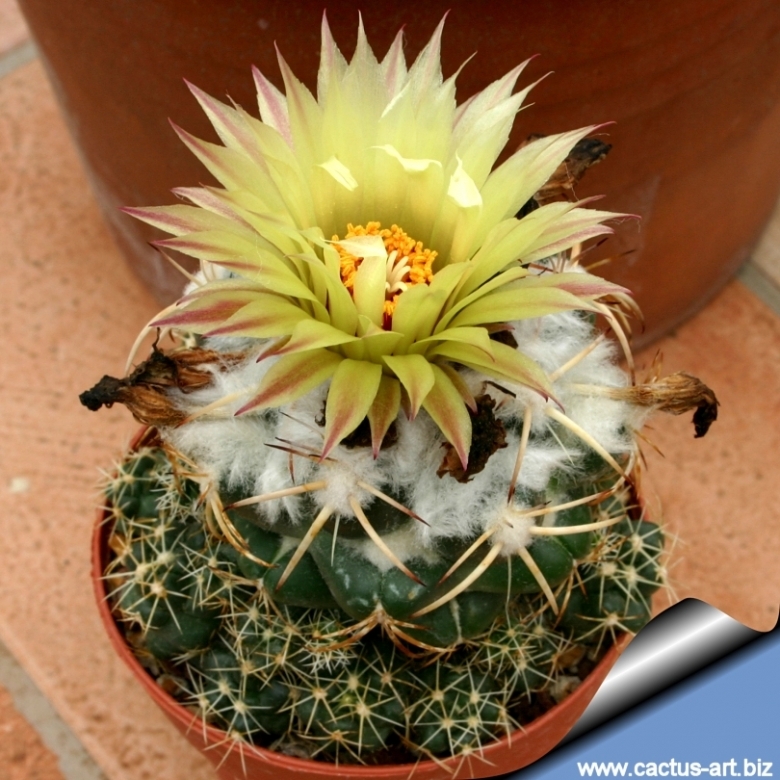 It is among the best-known cacti, with a wool covered globular stem with large, flat tubercles and spines not a real concern. The more common variety found in dcultivation (a.k.a. forma prolifera) produces lots of little suckers and bright yellow flowers in later summer to autumn. Origin and Habitat: South western Mexico (Morelos and Guerrero). Mammillaria elephantidens var. bumamma (Ehrenb.) K.Schum. Coryphantha elephantidens f. aurea hort. Coryphantha elephantidens var. recurvispina (de Vriese) hort., nov. comb. ined. Coryphantha elephantidens subs. sulcolanata (Lem.) hort., nov. comb. ined. Coryphantha elephantidens f. variegata hort. 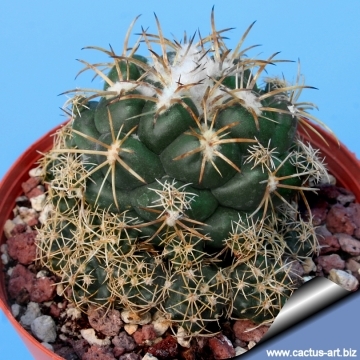 Description: Coryphantha bumamma is a flattened globular cactus with few, very large, rounded tubercles, bluish green. In adulthood it produces an abundant amount of attractive wool that covers its body. This will wash off if watered from above but will re-grow again. 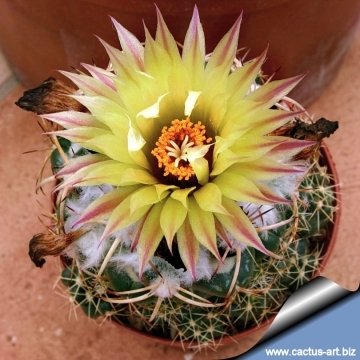 It is very similar to Coryphantha elephantidens but the flower are smaller and nearly yellow. Roots: It has a stout carrot-like root, almost equal in diameter to that of the stem itself. Stem: Flattened globular, broader than high, often (in habitat) arising only a little above the surface of ground, and are firmly anchored in the soil by a thick root, almost equal in diameter to that of the stem itself, up to 13 cm in diameter. Tubercles: Few, very large up to 27 mm wide and 16 mm tall, glossy green to bluish-green always broader than rounded, in 8-13 series, conical flattened, rounded on top, slightly pentaedrical at the base, with a woolly groove on the upper side. The axil in youth is very woolly, later naked. Without glands. Areoles: Elongate up to 4 mm long. Flowers: Sweet smelling large 5- 6 cm broad, yellow with reddish midstripe dorsally or bright rose with a dark stripe, inner perianth segments narrowly oblong to lanceolate, margin entire, acute, 5 mm wide, filament reddishat the base, lobes greenish, stigma longer then filaments. Blooming season: The flowers generally appear mid to late summer. Fruits: Claviform, very big, ca. 4 cm long, 10-13 mm diameter, whitish green with a reddish tinge. Seeds: About 4 mm long and 1 mm in diameter, light brown. 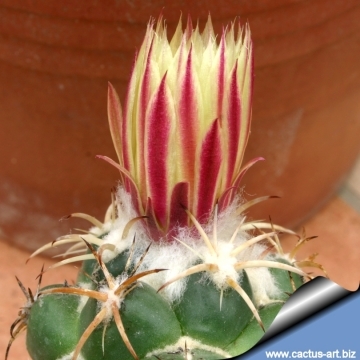 Remarks: At the moment there are a number of strongly offsetting plants in circulation labeled as Coryphantha bumamma; whilst being attractive plants these are not natural plants but mutant clones also known as caespitosa or prolifera. This plants may form large groups up to 50 cm in diameter. Coryphantha elephantidens (Lem.) Lem. : Large, depressed-globular cactus, often clumping with large dark-green tubercles rounded on top, the tubercles axil is very woolly. The radial spines are stout reflexed and adpressed to the body. Flowers whitish, yellow or pink. Coryphantha elephantidens f. aurea hort. : Mutant lacking chlorophyll pigment. The result is a completely cream-yellow or golden-yellow plant. Coryphantha elephantidens var. barciae L.Bremer: It has a big tap-root. Parastichy number 8/13. Coryphantha elephantidens subs. bumamma (Ehrenb.) Dicht & A.Lüthy: Strongly offsetting species forming large groups up to 50 cm in diameter. Stem glaucous green. 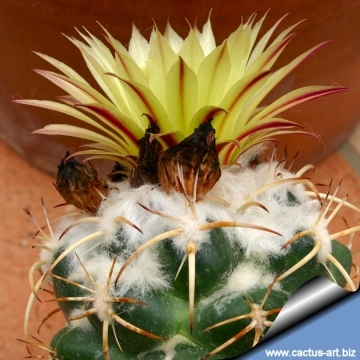 It is very similar to Coryphantha elephantidens but the flower are much smaller and nearly yellow. Coryphantha elephantidens subs. greenwoodii (Bravo) Dicht & A.Lüthy: Solitary or group-forming, flat-globose mostly under the ground-level, intermediate between Coriphantha elepantidens and Coriphantha pycnacantha. Coryphantha elephantidens var. roseiflora Y.Itô: Pink flowering form. Coryphantha elephantidens subs. sulcolanata (Lem.) hort., nov. comb. ined. 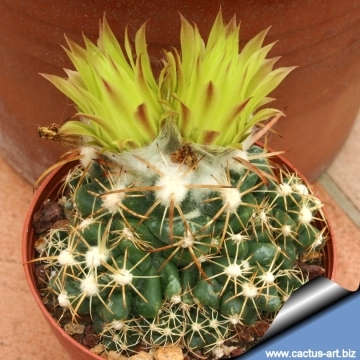 : Very similar (if not the same plant) to Coryphantha elephantidens but the flowers are always yellow and never pink. Origin: Hidalgo. Coryphantha elephantidens f. variegata hort. : Variegated form. The stems have sectors, patches or stripes with two colours, yellow and green. There are several forms of variegation. Coryphantha elephantidens cv. Tanshi Zougemaru: Cultivar with short but strong spines and very large tubercles. Flowers pink. Origin: Japan. Cultivation and Propagation: It is without problems, and regularly shows its large yellow flowers. It does best in slight shade, but does well in full sun too. It is sensitive to overwatering (rot prone), and needs a very porous soil with good drainage. It flowers quite early, but needs about 8-12 years to reach the typical, definite outlook. It tolerates fairly low temperatures as long as it is kept dry (hardy to -5° C or less for short periods of time). Propagation:: Propagation is by seed.